Warsaw (AFP) – The devastation wreaked by Typhoon Haiyan has become a rallying cry at UN climate talks, where the Philippines and other developing nations are demanding aid guarantees for future damage from global warming. The demand has created another deep fault line in the divided negotiations, for rich nations see it as a potential trap, locking them into a never-ending liability for compensation. Many of the world’s poorest nations are also the most vulnerable to the ravages of climate change, from severe storms to slower-onset effects like land-encroaching sea level rise and worsening droughts and floods. More than 130 developing states are now calling for an international “loss and damage” mechanism, bankrolled by wealthy nations, to be embedded in a 2015 global pact on climate change. Rich economies, say poorer nations, bear historic responsibility for global warming as they started the rush to burn fossil fuels which cause the greenhouse-gas problem. “The humanitarian support that is happening now in the case of the Philippines is very important… but at the same time it is also kind of subjective: it not that every country which is affected in the same manner can count on the same support,” explained Sven Harmeling of the CARE International humanitarian agency. “As the problem of loss and damage grows, ad-hoc solutions are no longer sufficient,” he told AFP. Among other things, the proposed mechanism should help developing states develop a technology and knowledge base to mitigate the climate risk and offer financial support to help stricken countries get back on their feet. An insurance scheme is among the options mooted. The issue nearly scuppered last year’s round of talks in Doha, Qatar — but the day was saved with a compromise to put in place “institutional arrangements” in Warsaw. This will be no easy task. “Codifying loss and damage issues in an agreement could lead to claims of legal liability, which would be problematic, to say the least,” Robert Stavins, director of the Harvard Environmental Economics Program, told AFP. Another question is whether a country hit by a climate-related catastrophe may itself be partly to blame by allowing people to live in a risky zone or failing to provide adequate protection or emergency care. Then there are the surging greenhouse-gas emissions from emerging giants such as Brazil, China and India, which will stoke warming in the future. For these and other reasons, some wealthy nations insist that “loss and damage” should be dealt with under existing disaster relief structures. EU climate envoy Juergen Lefevere told journalists in Warsaw last week there was “a huge number of organisations which actually touch upon these areas”. US negotiator Trigg Talley said the issue must be dealt with “in a way that takes advantage of current institutional infrastructure”. But the developing bloc says existing institutions do not have a dedicated mandate to deal with issues of loss and damage, particularly for slow-onset risks. It also insists that all the mitigation and adaptation in the world will not prevent climate losses in vulnerable countries. The planet is already 0.85 degrees Celsius (1.4 degrees Fahrenheit) warmer than in 1880, according to the UN’s International Panel on Climate Change. And scientists warn that further increases of up to 5.0 C are possible unless urgent emissions cuts are undertaken. “We are now beyond the point where all the impacts that will result from climate change can be avoided,” said Harmeling. 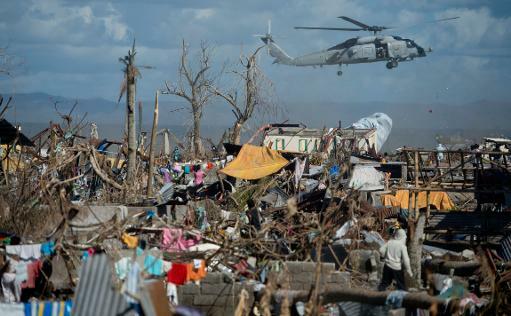 Juan Hoffmaister, lead climate negotiator for the Group of 77 developing nations on loss and damage, said the considerations were very practical ones.